L&J Technologies Flame Arresters are designed to provide a positive flame stop on low pressure tanks, storage tanks and anaerobic digesters containing flammable liquids, solvents or gases having a low flash point. The 94306 not only provides exceptional protection against fire from external ignition, but also offers maximum flow capacity. 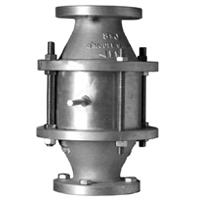 Their vertical flame aarresters are generally installed with pressure-vacuum vents, or in-line free vent to atmosphere. The tube bank design consisting of a spiral-wound crimped ribbon around a solid core, maximize flow capacity with minimum pressure drop. This unique design meets FM Factory Mutual approval for all sizes and material options. 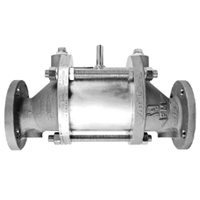 L&J Technologies Horizontal Inline Deflagration Flame Arrester is designed to provide a positive flame stop in horizontal gas piping systems containing flammable vapors having a low flash point. The 94407 not only provides exceptional protection against propagation of fire, but also offers maximum flow capacity. It is specifically designed to prevent liquid accumulation in the tube bank assembly. The tube bank design, consisting of a spiral-wound crimped ribbon around a solid core, maximizes flow capacity with minimum pressure drop. The standard flame arrester is Factory Mutual (FM) approved to meet the ATEX application requirements per EN 12874 and ISO 16852.